You always dreamed of owning a farm, right here in the city? 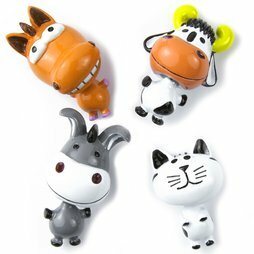 No problem, our fun quartet "Farm" makes it possible: The animal shapes are designed with a love for detail, spread good mood and are practical on top of it. The "rowdy gang" is just waiting to jump out of the box and get busy on your refrigerator or office file cabinet. The super magnet inside the head makes for a strong hold, while the rest of the body swings freely. An animal magnet is 4 x 2 cm big. Pet the magnetic cow and she might give you some fresh milk - maybe.